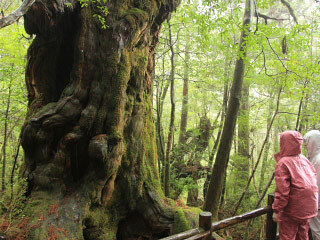 Yakusugi Land (ヤクスギランド) is one of main attraction in Yakushima Isuland. It is a nature park with full of Yakusugi, the giant cedar trees. It has a 3 hours of hiking course that you can enjoy a great nature of Yakushima. 0. at bus stop Anboko. 1. use bus to Kigensugi. 2. get off at Yakusugiland. Yakusugi Land is a nature park located in the middle of Yakushima. The altitude is from 1,000m to 1,300m and there are many Yakusugi in this park. There are many Yakusugi, moss and other mountain plans that feature Yakushima. There are several courses for beginners or experts. 32m tall and 9.5m girth. 1,500 years old. 33.8m tall and 8.2m girth. mother 31.3m tall and child 29.5m tall. 1,100 years old. 26.1m tall and 9.3m girth. 1,800 years old. 21.5m tall and 8m girth.